Unisex Child Mannequin Flesh Coloured With Lifelike Features. Also Perfect To Display Your Child's Christening Gown On In Their Nursery. 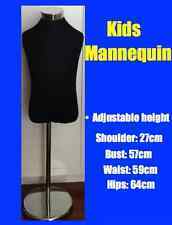 (1x Adjustable height black child mannequin. 4) All the kids mannequins are unisex. 2)The cotton cover is made of higher quality that can take more wear and tear than usual. 3)The torso can also be taken off the stand and placed on a table, great for using as a center piece. 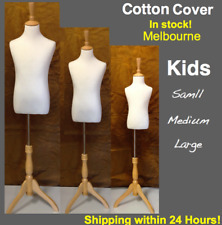 (1x Adjustable height child mannequin. 5) All the kids mannequins are unisex. 3)The cotton cover is made of higher quality that can take more wear and tear than usual. 4)The torso can also be taken off the stand and placed on a table, great for using as a center piece. The mannequin has removable arms and flexible/ bendable parts including both arms and fingers and one leg giving you an extensive variety of poses to use in your display. The white fabric covered model has thick foam padding and can be pinned as needed to achieve a perfectly fitted look. Torso Front with Hanging Hook. Gloss Finish,Black. 1 Child 8 - 10, Height 535 mm. CHILD plastic mannequin SC3. FASHION Child Mannequin 5yr. Clothes Racks. Clothes Hangers. Display Hooks. Display Cabinets & Counters. No finish - White Plastic. GLASS Base. Kid Mannequin. Large FlexiChild Mannequin Full Body Egg Head with Glass Base - White. Child Fabric Torso Premium White. How cute is this!?. Torso Height: 39cm. Kids form with wooden stand and top. Acrylic Displays & Stands. Slatwall Panel 2440X1220X18mm Premium Quality. Shoulder to shoulder width: 25cm. Child full body mannequin with egg head in skin colour. Made from fibre glass. Both arms and one leg are detachable, easy to dress. 120cm high, for age 6 - 7 year old. CHILD plastic mannequin 10yo SC1. FASHION Child Mannequin 10yr. Clothes Racks. Clothes Hangers. Display Hooks. Display Cabinets & Counters. No finish - White Plastic. GLASS Base. Eurodisplay child mannequins x 3 2 girls 1 boy. Mannequins needing a clean : have a couple of minor chips. girl with hair in side buns : 1200mm tall girl with bob hairstyle : 1100mm tall boy : 1100mm tall Includes : 3 x start up kits with gloves : spikes touch up paint. Condition is Used. Child Abstract Pose Mannequin. Who are you buying from?. This ultra full body child mannequin stands at 110cm tall. It is easy to dress, manoeuvre and is fully adjustable. The arms and head can be moved to create different poses. Height: 110cm. 1 x Child Mannequin. Use the Mannequin to display anything from clothes to fashion accessories and everything else in between. Stay ahead of the competition and let our Child Mannequin show the way. With its realistic features, our Child Mannequin comprises the entire body for a real-life dressing up. One Mannequin is for 1-2 Year Old and One for 3-4 Years Old. The mannequins have removable arms and flexible/ bendable parts including both arms and fingers and one leg giving you an extensive variety of poses to use in your display. (The mannequin is well constructed of 3 assembled parts: head, torso with legs, and arms. The whole child body is made of Eco-friendly PE. Colour: Light Skin Type (See Photos). Material: Eco-friendly PE (body), armoured glass （ base), and aluminium (stand). Mannequins & Tosos. Child Fabric Torso Premium White. How cute is this!?. Torso Height: 39cm. Acrylic Displays & Stands. Slatwall Panel 2440X1220X18mm Premium Quality. Shoulder to shoulder width: 25cm. 3 0 different styles of unbreakable plastic mannequin displays. 60 d ifferent styles of mannequin heads. Hanging string in the back of neck. Base: Round Natural Wooden Base. Round Natural Wooden base and top are included. With powder blue leather underneath, natural sea shells of all sorts cover this beautiful glass eyed child mannequin. An assortment of pearls, beads and sparkling diamante, 2 mm and up flash their brilliant colours as the light changes. The original mannequin is over 25 years old...and was just waiting for the right medium to be brought into life. A wonderful centrepiece artwork for a seaside home. Perfect for fashion clothing and accessories display. 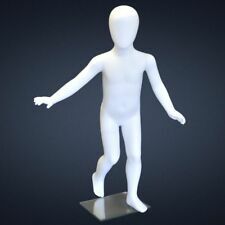 Full Body Child Mannequin - With its realistic features, our Child Mannequin comprises the entire body for a real-life dressing up. Use the Mannequin to display anything from clothes to fashion accessories and everything else in between. Torso Front with Hanging Hook. Gloss Finish,Skintone. 1 Child 8 - 10, Height 535 mm. Rare Italian Imported Unisex Lifelike Child Mannequin, Full Body With Moulded Hair. Made From Fibreglass, Both Legs And Arms Are Removable To Allow For Dressing. The Beautiful Facial Features Were Hand Painted And It Has Dreamy Eye Lashes. This mannequin is structured with aneco-friendly polypropylene (PP) material that has great impact and pressure resistant features. It also has alightweight feature that allows you toeasily move and transport it wherever you like. 3 0 different styles of unbreakable plastic mannequin displays. 60 d ifferent styles of mannequin heads. Hanging string in the back of neck. Round Natural Wooden base and top included. 30 d ifferent styles of rack displays. 2x New Gloss Finish Hanging Mannequin Torso With Hook. Hollow back allows you to pin most sizes of clothing to fit the torso attractively. 52cm high, shoulder: 31cm wide, Chest:23cm wide,Waist: 22cm wide, Hip: 24cm wide. 3 0 different styles of unbreakable plastic mannequin displays. 60 d ifferent styles of mannequin heads. Hanging string in the back of neck. Round Natural Wooden base and top are included. Straight pinnable. 3 0 different styles of unbreakable plastic mannequin displays. 60 d ifferent styles of mannequin heads. Hanging string in the back of neck. Round Natural Wooden base and top are included. 60 d ifferent styles of jersey cover body forms.